I remember reading the article "Special Diet Food Banks" from Living Without Magazine, a while back, and reading about that young girl with Celiac disease having to eat the gluten-containing food from the food bank, even though it would cause her much suffering, later. That story hurt my heart, and then I thought of those with life-threatening food allergies who wouldn't even have the option of eating certain foods, at all. Texas is the second most food insecure state in the nation. Defined, food insecurity is when you are so limited in resources to buy food that you are running out of food, reducing the quality of food that your family eats, feeding your children unbalanced diets, or skipping meals so your children can eat. 17.1 % of Texas’ population is food insecure. The rate of children living in poverty in Texas is 24.3%; the national rate is 20.0%. In Bexar County, that rate is 25.1% - that means that one in four children most likely struggle with food insecurity. Almost half of clients’ households seeking emergency food assistance are forced to make choices between food and other basic necessities. 48% report having to choose between paying for utilities or heating fuel and food; 47% had to choose between paying for rent or a mortgage and food; 39% report having to choose between paying for gas for a car or food. Each week, approximately 58,000 people receive emergency food assistance from an agency in the San Antonio Food Bank network. If you are allergic to one or more of the Top 8 food allergens (milk, eggs, peanuts, tree nuts, soy, wheat, fish and shellfish), then most of these foods are off-limits, or have to be scrutinized closely, due to possible cross-contamination issues. When weather disasters hit, there are a limited number of shelf-stable items that provide protein. When Sandy devastated the Northeast, for example, we collected money and sent peanut butter substitutes (Wowbutter, Sunbutter, etc.) and other allergy-friendly foods to the area food banks. 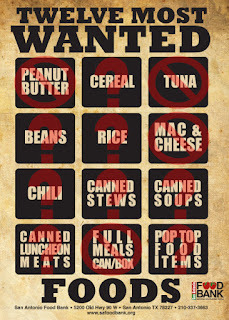 So, with Food Allergy Awareness Week going on this week, I'd like to do a Food Allergy-Friendly Food and Fund Drive. I called the San Antonio Food Bank to set one up. 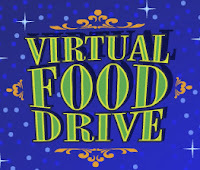 It's part physical food drive and virtual food drive. I love their Virtual Food Drive application. It allows you to "walk" through a virtual store and add things to your "basket". It allows you to purchase cases of items at incredible discount rates. I have set up the food drive under our local support group, the San Antonio Food Allergy Support Team. Would you like to help boost the San Antonio Food Bank's stock of safe foods for those in need? Here are some ways you help! Select food items that don't contain the Top 8 allergens. They don't have to be free of ALL Top 8 allergens, but consider skipping the mega-quantities of peanut butter. ;) They have items as economical as $1.50 for purchase. You can also add money to your "basket", which will procure more food items, if you just can't decide what you'd like to buy. For those with Amazon Prime: Perhaps consider ordering allergy-friendly food items, like Wowbutter and Sunbutter, and have them shipped to me. (Send me a message for my address.) I am waiting to hear back from the Food Bank, as to whether they can accept individual shipments, from others. If so, I will report back with that information. Even if you don't have Prime, orders over $25 qualify for free shipping. If you see my Recommendations widget, there are links to Sunbutter and Wowbutter via Amazon.com. Share this post! I will gratefully accept donations of any amount, but if you cannot spare any at this time, I completely understand, but perhaps you might find it in your heart to share this post, which is also a great contribution, in itself. I know it can be hard to ask others for contributions and it's hard for me, too, but I swallow those feelings and think of those for whom we're collecting and I also think of those who might be out there, trying to think of a way to give back, waiting for something to which they'd like to contribute. If you have any suggestions for safe, shelf-stable food items that I should purchase, I'm all "eyes". :) Thank you very much for reading! This drive is set to run through June 30th. Oh and email me your address, if they *can* accept shipments and I can amazon you an order for the drive! LOVE THIS! Hi Selena- This is great! I also read that article a few years ago. I've had a non-profit here in Austin since 2007 (but, I haven't had the opportunity to do anything with it - because of a lack of time). Brilliant! Absolutely Brilliant. Does TX know how lucky they are to have you in their midst? I'm inspired by beautiful hearts like yours and Keeley's and so many others!